BERKELEY, Calif. (AP) — California coach Justin Wilcox has always emphasized to his players the importance of keeping an even-keel approach every week. With a pivotal Pac-12 game against rival Stanford coming up, Wilcox is relaxing his approach a little. The 121st Big Game on Saturday definitely has a different feel to it this year with both teams bowl eligible for the first time since 2015. 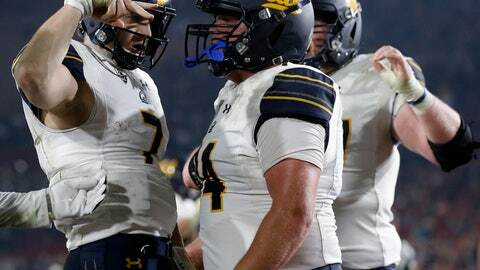 Cal secured its shot by rallying to beat USC 15-14 last week, ending a 14-game losing streak to the Trojans, while Stanford (6-4, 4-3) bounced back from consecutive losses with a 48-17 blowout of Oregon State. As big as beating USC was for Cal (6-4, 3-4), a win over Stanford would be even more so. The Cardinal have won eight straight against the Golden Bears, many of them lopsided victories. Getting the Axe back to Berkeley has been a major focus for Cal. Cal’s last win in the series was in 2009 when the Bears upset then-No. 14 Stanford 34-28. The Cardinal have been stout this season despite being in the middle of the Pac-12 most of the year. All four of Stanford’s losses have come against teams that are currently ranked — No. 3 Notre Dame, No. 8 Washington State, No. 17 Washington and No. 21 Utah. While both teams can enhance their bowl prospects with a win this week, Cardinal coach David Shaw is following Wilcox’s lead and wants his players to embrace the feeling of rivalry week. STINGY D: The game very well could be decided by which offense can score in the second half, something that opponents of both teams have struggled to do. Cal allowed only 40 yards after intermission in its win over USC while Stanford has given up 25 points in the third quarter all season. FEEL IT IN THE AIR: Cardinal quarterback K.J. Costello is ranked in the top 20 nationally in numerous passing categories, including completion percentage, passing yards and passing touchdowns. He also leads the Pac-12 in passing efficiency. The Golden Bears counter with a pass defense that is tops in the conference, allowing 183.8 yards a game. With Stanford having some of the tallest receivers in the Pac-12, the matchup figures to be a pivotal one. WHERE’S THE LOVE: Stanford running back Bryce Love was a Heisman Trophy finalist last year and was considered a leading contender for the award this season before injuries and a change in offensive philosophy derailed that. A year after rushing for 2,118 yards and 19 touchdowns, Love has been limited to 580 yards rushing and eight scores. Love has been nursing a sore left ankle since late September, the same injury he played through in 2017, but is expected to play against Cal. “Bryce is feeling fine,” Shaw said. FROM QB TO WR: Cal’s Brandon McIlwain has shared time at quarterback with Chase Garbers for much of this season and threw a costly interception near the end zone late in the fourth quarter of a 19-13 loss to Washington State two weeks ago. With the Bears receiving corps banged up, McIlwain has been getting a look at wide receiver in practice this week and could line up there against Stanford.